Happy Monday everyone! Christmas is only twenty days away! 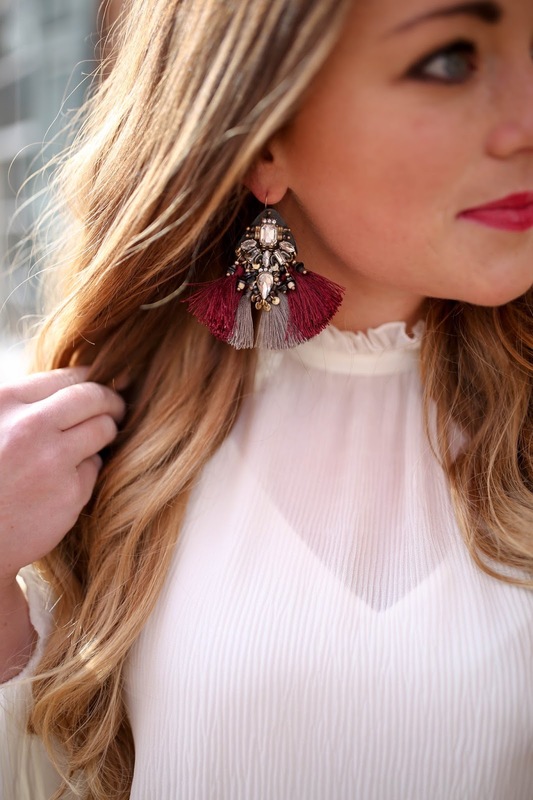 It’s time to start thinking about what you’ll be wearing for the special occasion, or what you’ll be wearing for other Holidays and Holiday parties through this month! If your family is like mine, this look that I have on will be worn for Christmas Eve service rather than Christmas Day! Our Christmas Eves are always a bit more formal, starts with a lovely, lively church service and then is followed by food and family game night! Last year, Pat’s family came over to my family’s home, and I believe we will do that again! It’s nice for Pat and I as we both grew up in the same town, we can then spend time with both of our families. I am obsessed with this white bell sleeve blouse from H&M (it’s only $18!) and since it’s sheer, I paired it with my go to basic cami essential from Topshop. This cami needs to be every single girl’s wardrobe, I wear it nonstop. This black sateen skirt from Express is ideal for any festive occasion. They have consistently been running 40-50% off so be on the lookout for that to get a good deal! I know I’ll be wearing it over and over again, all you need to do is throw on a different blouse and you’ll have a new look! How chic is this fur stole? I love to add this piece to my outfits during the holiday season. It’s an instant showstopper piece, one that is certainly fun and beautiful! I really recommend you try one out if you don’t have one already!